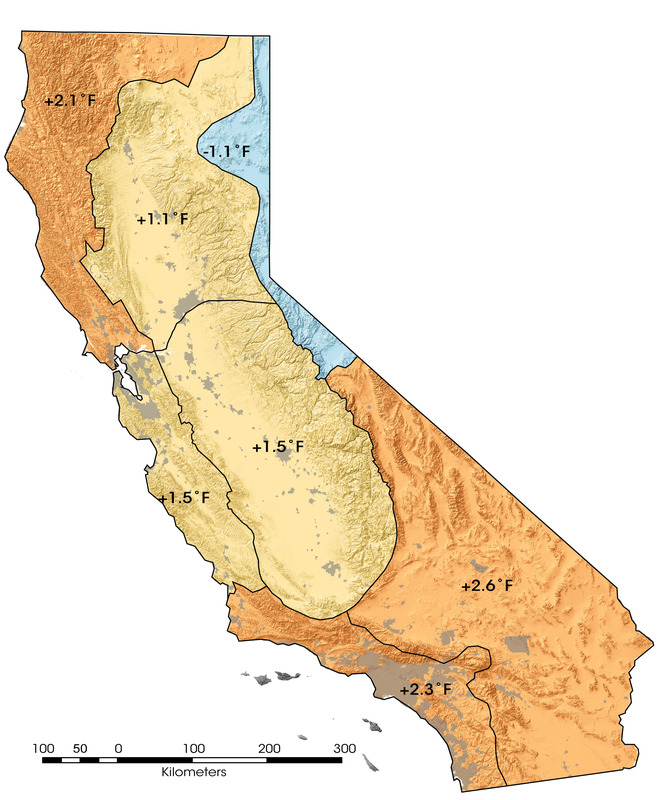 Average temperatures in California rose nearly two degrees Fahrenheit during the second half of the 20th century, with urban areas blazing the way to warmer conditions. 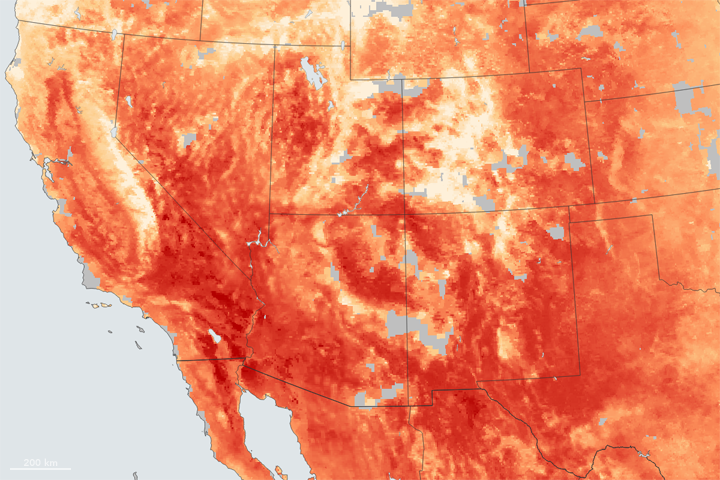 When scientists at NASA and California State University, Los Angeles, analyzed observations from 331 weather stations between 1950 and 2000, they found that average temperatures rose in 6 out of 7 of the state’s major climatic sub-regions. The scientists concluded that small increases measured in many rural areas may reflect the contribution of global warming due to rising greenhouse gas concentrations. Larger changes in and around urban areas are mostly due to growing population and the conversion of natural areas to urban ones. 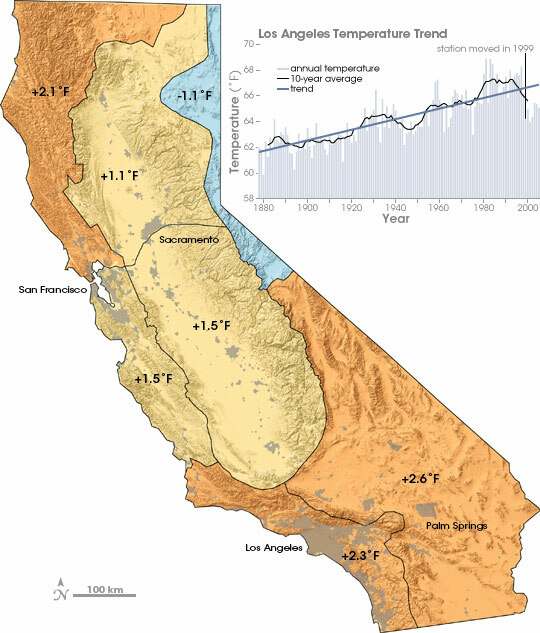 For some California cities, temperature records go back to the late 19th century. The graph shows a record of temperatures in Los Angeles from 1878 through 2005. Gray bars show annual average temperatures, the black line shows the rolling 10-year average, and the blue line shows the warming trend. Average temperatures climbed from around 62 degrees to 66 degrees. The drop in temperatures observed at the end of the 20th century resulted from the relocation of the official “downtown” Los Angeles station away from the more built-up part of the city to a more natural setting on the campus of the University of Southern California. The old site has so far remained operational, which gives scientists a chance to account for the impact of the move on long-term trends.